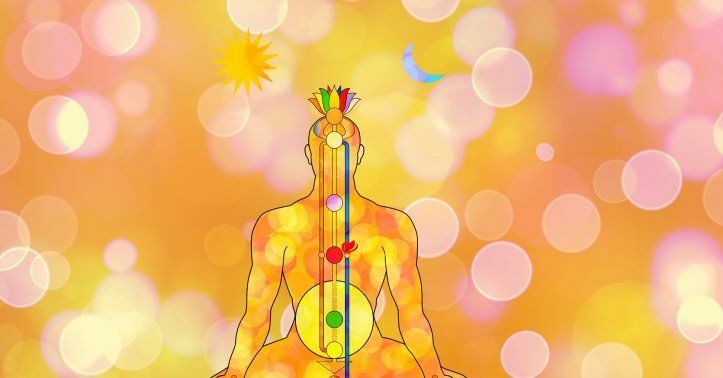 Secrets of the Seven Chakras: This is what you are made of! Our body consists of 7 major chakras which need to function properly for us to be healthy. These chakras are like lotus flowers that are rotating at their particular area and when they do not function properly they appear as a closed bloom of lotus, which causes blockage in that area. If one chakra does not work properly, it affects all the other chakras of the body, thereby, bringing imbalance in the energy of the body. This then manifests as some kind of ailment to the organs associated with that chakra. Function: Seat of kundalini energy, creative expression. Emotional energy: Survival, Power, Aggression; contact with the earth the will to live; being active in the world; confidence; strength, self-acceptance, vitality, flight or fight responses. Block to these energies: Fear of being in the world, feeling threatened in the above areas. Body language: Crossing the legs; legs look all twisted up like a spiral. These energies control: Adrenal gland; kidneys; spine; joint controller of the bladder; affects the whole nervous system. Diseases: Problems of the legs, hips, and buttocks. Location: Between the pubic bone and navel. Block to these energies: Feeling threatened in the above areas; lack of self-acceptance, self-love, and self-esteem. Body language: Sitting with hip area back in the chair and leaning forward. Standing with hand clasped in front or behind. These energies control: The gonads(ovaries and tests); fluid functions of the body. Diseases: Reproductive disorders; pre-menstrual tension and irregular periods, impotence in both sexes; bowel and bladder problems; AIDS. Location: Between the navel and base of the rib cage. Function: Power and wisdom center. Emotional energy: Connections and attachments to people and things; attachment and dependency; relationship to the environment; draws in energy; expels stress, "gut feeling" about people. Blocks to these energies: Fears or anxieties about anything out there. Body language: Hands/arms over stomach area; legs crossed, elbows on knees; things on lap; hands hooked in the belt. These energies control: Adrenals; stomach; liver; gall bladder; the digestive system. Diseases: Repressed energy at the cell level, often leading to cancer; arthritis; problems with the above-mentioned organs (jaundice, gall stones, constipation, diarrhea, ulcers, digestive problems), migraines, heart disease in relation to our fear of power. Location: Centre of the chest-sternum. Emotional energy: The whole: holistic thinking; impersonal feelings and functional love; healing center; humility; responsibility; goodwill; tolerance; sympathy and compassion. (The solar plexus is selective and determines what you see - it is linked to one's belief system. On the other hand, the heart is inclusive and sees what is - it picks up the soul quality of a person). Blocks to these energies: The biggest aspect of the heart is unconditional love and trust of others. Therefore, blockage comes from fear caused by old emotional hurts; lack of emotional security; fear of letting others in; and protection from recurrence of past hurts. Body language: Arms folded, one arm across the chest (holding books, etc at the chest). These energies control: Thymus gland; heart; blood pressure/circulation, the whole immune system; lungs. Diseases: Heart attack; problems with blood pressure; problems of the circulatory system, immune system disease(AIDS). Emotional energy: Creativity; self-expression; productivity; personal aliveness; individuality; action; desire for peace over conflict; trust of ourselves and others. Block to these energies: Stifling of the above-mentioned qualities; rigidity; unwillingness to compromise; frustrated communication. These energies control: Thyroid gland; voice; esophagus; neck; lower jaw; strongly linked with sacral chakra. Diseases: Diseases of the throat and lungs. Location: One inch above the center of eyebrows. Function: Intuitive center; seat of will and clairvoyance. Emotional energy: Left hemisphere function (rational mind); integrated personality balance; planning - seeing into the future; will; purpose; control; self-control; ambition; choice; assertiveness; telepathy; super-ego-injunctions of parents; programmed actions rather than appropriate responses. Right hemisphere function(creative mind); creative and artistic nature, gentle, receptive, irrational and intuitive. It represents our relationship with feminine nature, both within ourselves and with others. Blocks to these energies: Confusion in any of the above areas. Body language: Wiping, rubbing and tapping of brows; hand on the forehead when studying; furrowed brow when confused; eyes wide open when 'Aha' attained. These energies control: Pituitary gland - the master gland, controlling and balancing all the other glands in the endocrine systems; nose; ears; sinuses; autonomic nervous system (linked with root chakra); hypothalamus; lower brain. Diseases: Diseases of the autonomic nervous system; hormonal Imbalance; headache; migraines; sinusitis; dizziness; depression; eye/ear problems. Location: Top (Crown) of the head. Function: Connects us to our spiritual self. Emotional energy: Transpersonal awareness; the whole system; connectedness; relatedness; inner development; consciousness; unity with all things. Blocks to these energies: Feeling cut off; alone (aloneness versus 'All-one-ness'), as all other centers come into balance, they are activated in the crown. Body language: Hands over the head; stroking hair back; hats; various religious practices of covering or shaving this chakra; crowns on kings and queens as a symbol of opening the center of unity with all things. These energies control: The Pineal gland (this gland is light, sensitive, and is very active from birth until about seven years; secrets melatonin); time issues; circadian rhythms - jet lag effects. Diseases: Serious psychotic disorders; being totally cut off, as in severe grief; deeply hurt people in psychiatric institutions, deep shock; inability to face reality.